What are the Health Benefits of Sweet Lemons? Looking like Meyer lemons, this fruit had slightly yellowish and green skin which exudes the fragrance of roses and tastes like an orange. The rind of this fruit is very thin and when rubbed, it emits a sweet smell. Within a very small span of time, the taste completely changes to a bitter taste if you extract the juice and keep it for long. Loaded with Vitamin C, a consistent diet of Sweet Lime can help in keeping sickness away. This is why it is a common kitchen ingredient to keep cough and cold at bay. It also helps in boosting the immunity of the body and keeps the regular disorders at bay. Peptic ulcers can be best treated with sweet lime and it also helps in making the skin and hair healthy. Sweet lime may be juiced or eaten raw and alternatively you may also want to pickle it such that it enhances the taste buds. Keep your kitchen stocked up with Sweet lime for its various benefits and added advantages. How Lemon Can Delay your Period? Many women find lemon as the most effective natural way to stop or delay periods. As this citrus fruit contains Vitamin C in good amount which has some miraculous effects on blood vessels, which results into delayed periods. To let lemon work for you, you need to eat 2 lemons a day for 4-5 days before the expected start of menstruation. However, such excessive intake of lemon in such short span can badly hurt your digestive tract especially when taken with empty stomach. It is also worth to know that there are certain women admitted that taking lemon to delay periods can cause bad cramps and can make your next period painful. Thus, you need to go with this natural way with greater care. 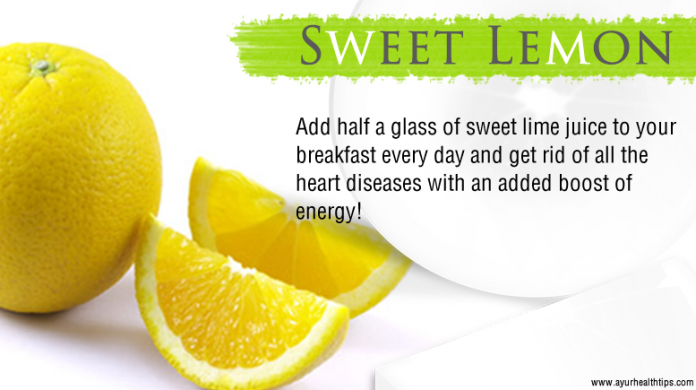 If you wish to add a wonder ingredient to your breakfast, all you need is half a glass of Sweet Lemon!